Finding the perfect fit for your college student’s off-campus housing can be a challenge. With so many competing student communities, how can you choose? It helps to focus in on a few key aspects, including location, the type of environment the community is providing, and what the community does to ensure a parent’s peace of mind. Proximity to campus is very important. Being close to campus gives your student quick access to resources for success and makes them feel more connected to their university. Having the convenience of walking to class is known to improve student academic performance; the Association of College and University Housing Officers-International (Acuho-I) published an article saying that students who felt more connected to their university are more likely to have educational success. Living in an academically oriented environment can give your student the support they need to succeed while attending college. In your apartment search, look for communities that provide residents with study spaces, computer stations, free printing and Wi-Fi, as well as individual floor plans with increased privacy features, like individual desks, bathrooms, and bedrooms, or privacy walls in shared bedroom spaces. Plus, look for communities that support an active, balanced lifestyle. Fitness centers, swimming pools, volleyball courts, recreation centers and other community amenities can help your student meet new people, give them a place to take a break from studying — all making the community feel more like home. 24/7 Staff: Look for a community that has onsite staff, maintenance and on-call services. Some communities have offsite management and offices, which may cause delays in response time. Individual leases: With this type of lease, each person signs their own lease for their own bedroom. If their roommate transfers or graduates, you won’t have to worry. You’re only responsible for your student’s rent. Roommate matching: If your student doesn’t have a roommate, look for communities with roommate matching. Students can fill out a profile and be matched with someone with similar habits and interests. Community events: Many student apartments also offer social and educational events and activities for residents to help them get more involved and make them feel connected to their community. The easiest way to start your search is to go online and Google “student housing,” along with the city or university name at the end. Visit the “Parents” page to get a feel for the type of environment the community provides to its residents, and check out the resources, amenities and activities available. If you want to see the community in person, just drop by or call the office to schedule a tour. Be sure to secure your student’s space early! The earlier your student signs a lease, the better their chances are for securing their first preference in floor plans. Crossing housing off your to-do list ASAP allows your student (and you) to worry less and focus hard on the rest of the spring semester. Discovering a student housing management company that supports your student’s lifestyle and goals can make all the difference. American Campus Communities, the nation’s leading student housing company, is dedicated to creating the right environment for students across the nation. ACC has understood the student experience from day one — in fact, the company’s CEO was a resident assistant in college, and co-founded ACC because he believes that students deserved an environment tailored to their needs. American Campus Communities offers a wide array of properties and floorplans at a variety of price points that appeal to every budget. Find the perfect fit at an American Campus community today! 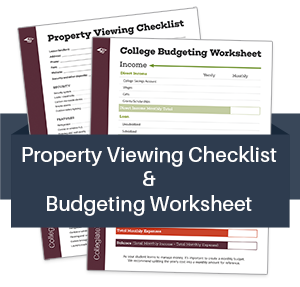 Join our community for weekly articles and a free property viewing checklist and budget worksheet.